I always wanted to have a coffee shop/bike shop kind of business. But while doing the business plan it became apparent I had to pick; mostly due to permitting issues and the financial resources it would require to start two very different types of businesses. A few mentors warned against the concept because they believed a space that houses two businesses confuses customers. I agreed. So, instead the business plan incorporated the idea of “a coffee shop that loves bikes and bike riders who love coffee.” We had to focus our passion on the coffee and the art and craft of making good coffee. But how do we add bikes? First, we formed Team Caffeine and Team Decaf, installed a bike rack, started our Bean Messenger Service, produced the Tazza D’Oro water bottles and the water bottles we did in partnership with Trek of Pittsburgh – all filled with fresh coffee beans, and provided sponsorship for the Pittsburgh Women’s Racing Team – Steel City Endurance. Over the past couple of years we have also had a really great relationship with the folks at Bike Pittsburgh by engaging our network of customers with the benefits of being a Bike Pittsburgh member and also being a distribution center for the Pittsburgh Bike Maps. I also have the honor of serving on the Bike Pittsburgh Board. 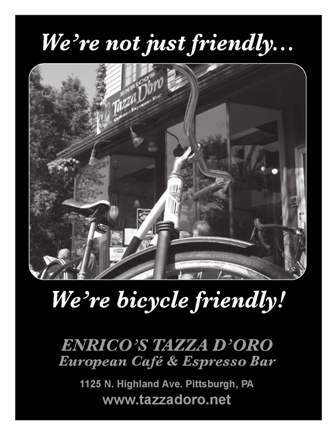 Beginning this month we have become one of Bike Pittsburgh’s partners. Our partnership is centered around our commitment to promote more bikes on the street and ongoing advocacy for continually making Pittsburgh more bike friendly. We will offer workshops in conjunction with Bike Pittsburgh to educate cyclists on such subjects like commuting, and bike maintenance. We will also install an additional Bike Pittsburgh bike rack that will hopefully be installed this week. We are incredibly excited to be Bike Pittsburgh’s first partner. We hope it sets a precedent for small and large businesses along with community residents to make a commitment to making changes in our communities which directly impact our quality of life in Pittsburgh. Then today, while working on this post, our mailman Mike, delivers a copy of Fresh Cup Magazine. Fresh Cup is a specialty coffee magazine which writes about trends in the industry, new products and interviews industry leaders. The front cover is a picture of a guy on a really cool single speed bike, drinking a coffee in front of a “bike thru window”. The lead story is titled: “The Chain That Binds: Bike and Coffee Cultures” (check out the story – click here). I am so psyched! Riding in the cold today wasn’t so bad and all gears seem to be clicking. Amy,Thanks so much for your support of our team! Our cool team jerseys should be in by April, hopefully early, and we'll do a second jersey/kit order mid summer or fall for all those who can't wait to get their hands on one! Suzanne, we are really excited about the team jersey too. Can't wait to hang it on our walls with all the autographs on it. Let's try to work something out that we can keep our customers in touch with the happenings of the team. Congrats to you! Your shop definitely has the most bike-friendly atmosphere of any of the coffee shops that I frequent in the East End and it's super cool that you're working with Bike Pittsburgh even more now! Nathan, the whole experience of bikes and coffee in some way feel very surreal but authentic to me. It was awesome to have a coffee industry magazine confirm that for me. I have loved bikes from a very young age and to have my two passions come together I guess is the surreal part.